Have I mentioned how much September's 31 Day Challenge inspired me? Not only did it introduce me to a bunch of awesome new bloggers and blogging groups... it really made me think creatively in different ways than what I was used to. It left me wondering... how could I cultivate that creativity after #31DC2014 was over?!? I'm proud to announce my first weekly series......... Fishbowl Friday!!! So I thought to myself... how fun would it be to just pick a prompt out of a container and paint my nails accordingly? Done and done.............. Fishbowl Friday was born! Originally, I planned to just pick the prompt at random on a Thursday night. Buuuuut, then I realized that my schedule and some of the more involved prompts don't really allow for that. Rather than just let a good idea go... 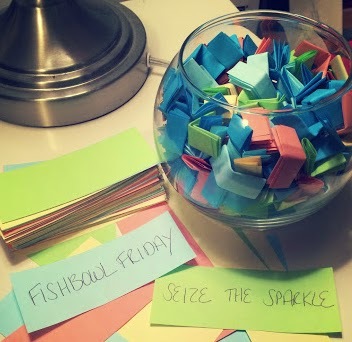 I decided that I would pick my Fishbowl Friday prompt on either Tuesday or Wednesday each week. Tayabak actually caught my eye because of how bright it looks on Rainbow Honey's website and in swatches. 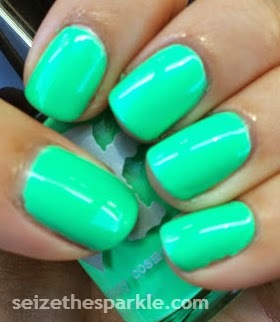 It's also such a pretty, bright, minty green... I had to have it! I ordered it along with October's mystery bag right before my No Buy began. My experience with 488nm was enough to make me want every single creme polish Rainbow Honey makes. The formula on Tayabak was no different. The brush was easy to work with, and I could've stopped at 2 coats if I wouldn't have forgotten to wrap my tips. Daydreaming while polishing leads to many, many coats of polish for me. I thought about doing gradients on the accent nails, or adding a little glitter, but decided against it. Maybe tonight? I don't know if I want to put anything over this gorgeous color! 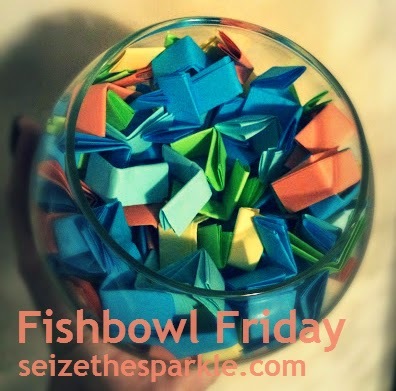 Next week, I'll have another random prompt from the fishbowl for your Friday! Until then... hope you enjoy the rest of this Friday, and Happy Weekend!